Against the dark backdrop of Spanish mistreatment of Native Americans during the Conquest, Bartolomé de Las Casas stood like a lighthouse. The fiery friar was the leading defender of the Indians against cruelty and abuses. 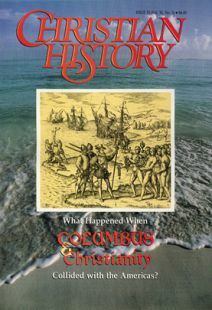 His father sailed on Columbus’s second voyage. Las Casas himself came to Hispaniola in 1502 as a priest, but he lived as most Spanish gentlemen, with land and Indian servants. Several factors combined to change Las Casas’s life. In 1511 he heard the Dominicans’ preaching campaign against Spanish mistreatment of Indians. That same year he accompanied the Spanish expedition to Cuba and witnessed its cruelty toward the natives. Then in 1514, Las Casas, age 40, turned around. He was preparing a sermon, searching the Scriptures for an appropriate text, when he chanced on this passage from the (apocryphal) Book of Sirach: “If one sacrifices from what has been wrongfully obtained, the offering is blemished; the gifts of the lawless are not acceptable” (34:18 RSV). The following Sunday, he announced from the pulpit that he was divesting himself of the natives entrusted to him (in effect, his slaves) and would now serve and defend the Indians. For the next seven years, he spent most of his time traveling between Spain and America, seeking the crown’s help to protect Indians. After several years of agitation, Las Casas was granted by King Charles V a territory in present-day Venezuela. There, Las Casas could test his theory that the Indians would be better evangelized by persuasion than by force. But the project failed when the Indians rebelled against the settlement. Las Casas went through a time of self-examination, finally entering the Dominican Order in 1522. He evangelized in Santo Domingo, Central America, and Mexico, where he was Bishop of Chiapas from 1544 to 1547. Often, he met stiff opposition from Spanish land owners and even fellow missionaries. “Soon after [the 30,000 natives of Cholula had welcomed and offered to lodge the Spaniards,] the Spaniards agreed to carry out a massacre-or as they called it, ‘a punitive attack’—in order to sow terror and apprehension, and to make a display of their power. . . .
“The Spaniards had asked for five or six thousand Indians to carry their cargo. When all the chiefs had come, they and the burden bearers were herded into the patios of the houses. . . .
“When they were all placed close together, they were bound and tied. At the closed doorways, armed guards took turns to see that none escaped. Then, at a command, all the Spaniards drew their swords or pikes, and while their chiefs looked on, helpless, all those tame sheep were butchered, cut to pieces. Such writings influenced Charles V in 1542–43 to approve The New Laws, which were designed to limit Spanish control and abuse of Indians. Unfortunately, they had little effect. Ironically, in his eagerness to protect the Indians, Las Casas once advocated bringing in Africans to replace the Indian slaves. However, he later bitterly repented of that position. Until his death at age 92, the so called Defender of the Indians actively lobbied in Spain on the Indians behalf, becoming increasingly radical. For example, he advocated the withdrawal of all Spaniards from the Indies. Opponents considered Las Casas a fanatic and sensationalist. Admirers have called him the greatest philanthropist the Iberian race has ever produced. Members of Catholic religious orders customarily took vows of poverty, chastity, and obedience. But Jesuit missionary Pedro Claver pledged himself to a fourth vow: Petrus Claver, aethiopum semper serous—“Pedro Claver, slave to the Negroes forever.” He proved true to his word. Born into a wealthy family near Barcelona, Spain, Claver joined the Jesuit order at age 22, and eight years later, in 1610, sailed for Cartagena in Nueva Granada (present-day Colombia). There he was appalled by the Spaniards’ treatment of African slaves. To minister to the slaves, he began boarding slave ships docked in port. He also visited slaves in the hellish warehouses where they were held. It was not unusual for Claver to find untended naked corpses covered with flies. Claver and fellow workers would dispense fruit, clothing, and medical care, and he would preach to the slaves. Later he helped start a hospital and leprosarium. Claver succeeded in his effort to let the slaves hear Christian preaching before their masters came to get them. He is said to have baptized up to 300,000 slaves during 40 years of ministry. Fellow Jesuits complained when Claver insisted that slaves be welcomed into the church on equal terms with whites. And wealthy slave owners feared Claver would, by making slaves feel equal, incite revolt. On the street Claver greeted only Africans and the whites who supported his work. When wealthy Spaniards sought to make confession to him, he usually declined, saying slaves were his first priority. In his latter years, Claver suffered paralysis. Ironically, his companions entrusted him to the care of a slave who cruelly neglected him. Yet he never complained, even when visitors stole items from his room (as relics of a saint) while he lay there. In 1896 Claver was recognized as the patron saint of missions to the Negroes. Luis Beltrán often doubted his missionary call. But the Dominican friar never wavered in protesting Spanish mistreatment of Indians in Nueva Granada (modern Colombia), nor in showing concern for their spiritual welfare. Beltrán made such an impact during only seven years of Indian ministry (1562–1569), he became the first canonized saint of the Americas. Hearing about thousands of Indians without God, the 36-year-old sailed for Cartagena in 1562. He taught and baptized by day (an estimated 25,000 in seven years) and prayed and did penance by night. He also confronted rich landlords over their harsh treatment of Indian laborers. The landlords in turn tried to impede his work among the Indians. One whom he had rebuked sent a woman to Beltrán to try to seduce him and discredit his ministry. A great admirer of Bartolomé de Las Casas, Beltrán was deeply troubled when Las Casas challenged his practice of granting absolution to cruel landholders. Las Casas had asked him to deeply examine his conscience before doing so. Beltrán concluded he was incapable of cutting through the complexities of missionary work. Soon thereafter, Beltrán requested to return to Spain, where he continued in ministry. His seven years of service were so impressive, though, he was declared in 1690 the patron saint of Nueva Granada. While others his age began to slow down, Juan de Zumárraga at age 60 was sent to Mexico by Charles V as “Protector of the Indians” and the country’s first bishop. He quickly made his mark. The Audiencia (ruling council) that followed Cortés treated Indians with unparalleled cruelty, which Zumárraga publicly denounced. The Audiencia then forbade him to preach or to communicate with higher authorities, especially the Council of the Indies. Zumárraga defied the ban and sent a protest letter to the Council of the Indies. The letter was intercepted. The bishop then traveled to the coast and convinced a sailor to smuggle a letter (inside a cake of wax) to the Council. Because of his letter, the corrupt Audiencia was ultimately replaced. He also founded schools for Indian children of both sexes, using education to evangelize both children and parents. He also helped start the first seminary and high school in the Americas, imported the first printing press, and helped found what became the University of Mexico. Still Zumárraga, like many of his day, remained paternalistic to Indians. He insisted they needed some sort of compulsion to work; thus, he approved of the encomienda system. The Protector of the Indians also acted as inquisitor in Mexico and processed 130 cases. On the whole, though, Zumárraga did more than most in his day to alleviate the sufferings of Native Americans. In 1547, he was named Mexico’s first archbishop, but he died before his installation. John Maust is editor of Latin America Evangelist magazine and is author of several books, including New Song in the Andes (William Carey, 1992).